Ahmadi, A., Khalesi, S., Bagheri, M. (2018). Automatic road crack detection and classification using image processing techniques, machine learning and integrated models in urban areas: A novel image binarization technique. 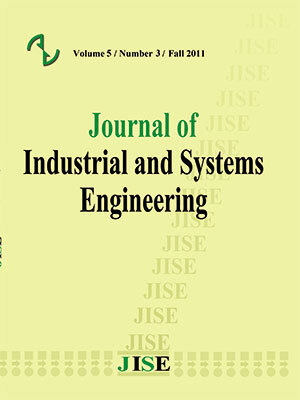 Journal of Industrial and Systems Engineering, 11(Special issue: 14th International Industrial Engineering Conference), 85-97.
abbas Ahmadi; Sadjad Khalesi; MohammadReza Bagheri. "Automatic road crack detection and classification using image processing techniques, machine learning and integrated models in urban areas: A novel image binarization technique". Journal of Industrial and Systems Engineering, 11, Special issue: 14th International Industrial Engineering Conference, 2018, 85-97. Ahmadi, A., Khalesi, S., Bagheri, M. (2018). 'Automatic road crack detection and classification using image processing techniques, machine learning and integrated models in urban areas: A novel image binarization technique', Journal of Industrial and Systems Engineering, 11(Special issue: 14th International Industrial Engineering Conference), pp. 85-97. Ahmadi, A., Khalesi, S., Bagheri, M. Automatic road crack detection and classification using image processing techniques, machine learning and integrated models in urban areas: A novel image binarization technique. Journal of Industrial and Systems Engineering, 2018; 11(Special issue: 14th International Industrial Engineering Conference): 85-97. The quality of the road pavement has always been one of the major concerns for governments around the world. Cracks in the asphalt are one of the most common road tensions that generally threaten the safety of roads and highways. In recent years, automated inspection methods such as image and video processing have been considered due to the high cost and error of manual methods. For this purpose, different image processing techniques and classification methods have been developed by many researchers. In this study, we propose an integrated model includes a heuristic image segmentation technique for crack detection. Furthermore, the accuracy of various classification models such as KNN, decision tree and SVM will be compared. Finally, 5-fold cross validation shows that Subspace KNN method will be more accurate than other classification models which are used in this study. On the other hand, we also simulate the depth and density of different segment of crack by utilizing density matrix values. Ayenu-Prah, A., & Attoh-Okine, N. (2008). Evaluating pavement cracks with bidimensional empirical mode decomposition. EURASIP Journal on Advances in Signal Processing, 2008(1), 861701. Chambon, S., & Moliard, J. M. (2011). Automatic road pavement assessment with image processing: review and comparison. International Journal of Geophysics, 2011. Cheng, H. D., & Miyojim, M. (1998). Automatic pavement distress detection system. Information Sciences, 108(1-4), 219-240. Cord, A., & Chambon, S. (2012). Automatic road defect detection by textural pattern recognition based on AdaBoost. Computer‐Aided Civil and Infrastructure Engineering, 27(4), 244-259. Cui, L., Qi, Z., Chen, Z., Meng, F., & Shi, Y. (2015, August). Pavement Distress Detection Using Random Decision Forests. In International Conference on Data Science (pp. 95-102). Springer, Cham. Dhital, D., & Lee, J. R. (2012). A fully non-contact ultrasonic propagation imaging system for closed surface crack evaluation. Experimental Mechanics, 52(8), 1111-1122. Gavilán, M., Balcones, D., Marcos, O., Llorca, D. F., Sotelo, M. A., Parra, I., ... & Amírola, A. (2011). Adaptive road crack detection system by pavement classification. Sensors, 11(10), 9628-9657. Ho, T. W., Chou, C. C., Chen, C. T., & Lin, J. D. (2009). Pavement distress image recognition using k-means and classification algorithms. In Proceeding of the International Conference on Computing in Civil and Building Engineering, Nottingham. Huang, J., Liu, W., & Sun, X. (2014). A pavement crack detection method combining 2D with 3D information based on Dempster‐Shafer theory. Computer‐Aided Civil and Infrastructure Engineering, 29(4), 299-313. Mohan, A., & Poobal, S. (2017). Crack detection using image processing: A critical review and analysis. Alexandria Engineering Journal. Nejad, F. M., & Zakeri, H. (2011). An expert system based on wavelet transform and radon neural network for pavement distress classification. Expert Systems with Applications, 38(6), 7088-7101. Oliveira, H., & Correia, P. L. (2013). Automatic road crack detection and characterization. IEEE Transactions on Intelligent Transportation Systems, 14(1), 155-168. Oliveira, H., & Correia, P. L. (2009, August). Automatic road crack segmentation using entropy and image dynamic thresholding. In Signal Processing Conference, 2009 17th European (pp. 622-626). IEEE. Shi, Y., Cui, L., Qi, Z., Meng, F., & Chen, Z. (2016). Automatic road crack detection using random structured forests. IEEE Transactions on Intelligent Transportation Systems, 17(12), 3434-3445. Some, L. (2016). Automatic image-based road crack detection methods. Tedeschi, A., & Benedetto, F. (2017). A real-time automatic pavement crack and pothole recognition system for mobile Android-based devices. Advanced Engineering Informatics, 32, 11-25. Tong, Z., Gao, J., Han, Z., & Wang, Z. (2017). Recognition of asphalt pavement crack length using deep convolutional neural networks. Road Materials and Pavement Design, 1-16. Zhang, D., Li, Q., Chen, Y., Cao, M., He, L., & Zhang, B. (2017). An efficient and reliable coarse-to-fine approach for asphalt pavement crack detection. Image and Vision Computing, 57, 130-146. Zou, Q., Cao, Y., Li, Q., Mao, Q., & Wang, S. (2012). Crack Tree: Automatic crack detection from pavement images. Pattern Recognition Letters, 33(3), 227-238.